Typical Tank setup: Rocky Malawi tank with plenty of hiding spaces/caves. 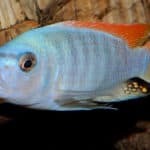 Compatibility: Combine with other Mbuna but avoid adding similar looking males. 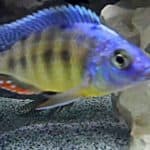 Feeding: Omnivore – Best thrives on specially made African Cichlid pellets or flakes. It is mostly vegetarian so foods with really high meat and protein content should be avoided. 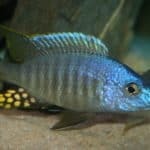 Breeding: Pseudotropheus Elongatus Ornatus are maternal mouthbrooders like many of the African Cichlids. 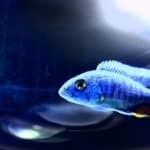 The male will entice a mate and as the female lays her eggs he will fertilise them. The process continues till all the eggs are fertilised and the female holds them in her mouth for 3-4 weeks during which time she does not eat. 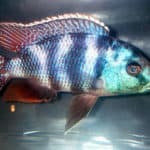 Additional Information: The Elongatus Ornatus is a similar cichlid to the Pseudotropheus Elongatus Chewere, in fact the males of these 2 species are very similar in appearance with the latter displaying a little more intense blue and black. 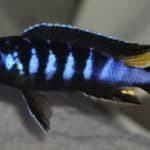 The females however, are completely different; Ornatus females are a faded yellow in comparison to the blue and black stripes on a female Chewere. 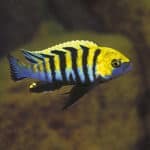 The 2 species share in temperament and behaviour also so they should not be housed with each other due to their similar appearance and also not with any other fish that resembles them in appearance. 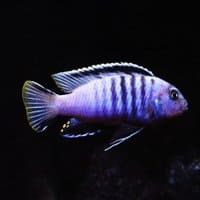 As with any Mbuna tank a rock aquascape providing plenty of caves and hiding spots is necessary. 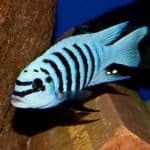 Angelfish breed for life. If one of the pair dies, the other will not breed again!